George Farmer sets up a fabulous chaotic-styled planted tank in this step by step guide. I approached this commission for PFK with trepidation. 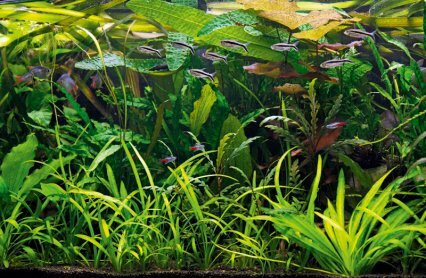 For an aquascaper more comfortable with nature aquariums and their hardscape-dominated designs, clean lines and fine textures, a jungle style is practically the polar opposite. With its large-leaved plants, little or no visible décor and limited open space, such a challenge would be akin to underwater chaos! To do a jungle tank justice you need a medium to large aquarium for a good variety and quantity of plant and fish species. I had an unused 120 x 45 x 45cm/ 48 x 18 x 18” braceless and rimless tank and cabinet in the garage. The tank had picked up some nasty scratches and the cabinet had seen better days, and I gave it a thorough clean with vinegar and window cleaner to remove lime and watermarks. Turning it halfway round moved the ugliest scratches to the rear. My father-in-law made me a new removable front panel that fits perfectly onto the cabinet, replacing some dodgy doors. UKAPS founder Dan Crawford had the tank and cabinet previously and made a lighting bracket to suspend an overtank luminaire. However, rather than suspending my luminaire with cables from the bracket, I drilled holes into it and attached the luminaire using nuts and bolts. Using a PAR meter to measure the light produced by two of the four 54w HO T5 fluorescent lamps I positioned bracket and luminaire at an appropriate distance above the water surface to give the right readings at the corners. Large planted tanks need large or multiple filters and I’m using a Fluval FX5 to give around ten times tank volume turnover per hour. To minimise equipment I fitted an external inline heater and external inline CO2 diffuser. To use this gear I had to step down the supplied 25mm/ 1” filter hose to 16mm, using pond fittings. This restricts flow but the FX5 is so powerful it’s not an issue. The filter inlet and outlet are black and at each end of the tank, and against the background and dense planting are almost invisible. Big, bold textures are the order of the day. Tall plants that reach the surface in combination with floating plants block some light and provide a dappled effect, just like a real jungle canopy. Plants compete for light and grow into each others’ territories. The huge plant mass and overshadowing effects give fish a real sense of security, as well as high oxygen levels and nutrient removal rates. The more species the better the look and the mix of textures keep the viewer interested. I have chosen tropical lilies to add a dash of red to the centre. The foreground should have smaller plants but, to mix it up, I’ve also added taller new plants species — Aponogeton crispus ‘red’ and Hygrophila pinnitifida. Wood protruding from the surface and surrounded by floating Amazon frogbit plants add an extra dimension. Given enough time the Amazon swords, Aponogeton and lilies may even send out flowers. The combination of good light, nutrient-rich substrate, good quality liquid fertilisers, pressurised CO2 injection and effective circulation provide superb growth rates. It took four weeks for the aquarium to be full of plant mass! Maintenance consists of a 50% weekly water change and pruning only as necessary. Any leaves with algae can be removed immediately and the Amazon frogbit needs thinning out periodically to prevent it blocking too much light. Liquid fertilisers are added daily to ensure the huge plant biomass gets enough nutrients to prevent deficiencies. The soil-based substrate also provides ample nutrients to feed the root-feeding plants such as the Amazon swords. Floating plants are great for any planted tank. They grow quickly because they’re near the light and have access to unlimited CO2. Their dangling roots quickly use up nutrients, produce oxygen and provide shelter for fish. The aquarium holds almost 240 l/53 gal. It’s braceless and rimless, making it ideal for suspended lighting that allows the surface of the water to be viewed, adding an extra dimension to the aquascape. Exposed wood and floating plants will add further interest later on. I’m using 20 litres of TMC NutraSoil, a complete soil with nutrients. It’s easy to plant into and reduces and stabilises pH. It leeches ammonia after initial installation, making it ideal for fishless cycling a new filter. Ensure ammonia and nitrite are undetectable before adding livestock. Two pieces of Unipac XL Sumatra wood are added to each end of the tank. Exact positioning is not vital as it will be eventually completed covered or hidden. The wood is pre-soaked and cleaned to prevent it from floating and staining the water. Large portions of Anubias barteri are attached to the wood using cable ties which can be removed once the roots have anchored to the wood surface. Anubias grows slowly and is prone to algae. Floating plants and Giant vallis added later help keep it shaded. Bolbitis heudelotii is attached around the wood using ties. It does best in good flow and is said to prefer soft acidic water. The rhizome needs to be exposed to open water too. Good CO2 is essential to ensure healthy growth, but Bolbitis does not require high lighting. Java ferns are also attached with ties. They are susceptible to drying out, so must be sprayed regularly until the aquarium is filled. Plants attached to wood instantly help fill an aquascape. Java ferns and Anubias are great additions to low-tech planted tanks without CO2 injection. The aquarium is slowly filled with water. My tapwater is hard, but the substrate helps soften and acidify it. I have filled the tank because this soil is easier to plant into when soaked. The soil causes initial cloudiness, but soon clears once the filter is running. Giant vallis and Crinum are planted in the rear corners. The vallis will send out runners and help cover the surface, adding to the jungle-style dappled light effect. The crinums add texture and should be planted with the top of their bulbs exposed to the water column. The medium Amazon swords are planted around the bases of the wood. Although shaded by the ferns and Anubias, and unable to receive much light, they grow well due to a combination of good nutrients in the substrate and water, as well as CO2 injection. The remaining plants are added. Lighting is set to nine hours, with CO2 injection on a solenoid. Later the diffuser is replaced with an external in-line, 15ml of liquid fertilisers are added daily and half the water changed weekly. The filter is fishlessly cycled before adding the tetras. Feed fish three times daily with dry and frozen foods. Check CO2 and bubble rate. 50% water change with de-chlorinator. Clean inside of glass with long-arm scraper. Clean filter in old aquarium water. Notes: This classic tetra is often kept in community tanks, but to do it justice needs to be kept in large shoals. This also helps prevent aggressive behaviour. It often swims at a 45° angle. Notes: This develops striking red fins with a blue sheen to the body when mature and kept in suitable conditions. Notes: This popular fish needs to be kept in shoals. Try to buy from a reputable source to help avoid the incurable Neon tetra disease. They show best colours in heavily planted tanks.